Lt General P.K. 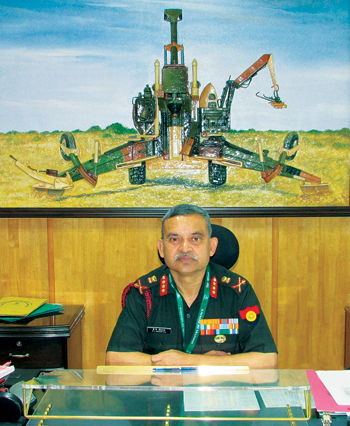 Srivastava, Director General of Artillery, in an exclusive interview with SP’s Land Forces, on the occasion of the Gunners Day on September 28, 2017, covered a wide range of subjects including the role of Artillery in the future battlefield, future artillery technologies and modernisation of Artillery. SP’s Land Forces (SP’s): What is likely to be the shape of the future battlefield and the likely roles of artillery in this new dispensation? Likely Shape of Future Battle Field. The future battlefield will be characterised by short and intense engagements; non – linear battles; simultaneity of operations; increased battle field transparency; synergised and orchestrated employment of fire power resources and employment of precision and high lethality weapon systems in a hybrid warfare environment. All of this under the overall backdrop of a nuclear, biological and chemical warfare threat. Synergised and orchestrated employment of all available firepower resources to shape the battlefield and to degrade the enemy in contact and depth battle entailing employment of mortars, guns and long range vectors in conjunction with Indian Air Force to achieve decisive defeat of the enemy. Therefore artillery should have a balance of guns (towed and self propelled), rockets and missiles. There is also a need to have a variety of ammunition and warheads to achieve desired results at the target with minimum burden on logistics. Artillery will be responsible for detecting enemy artillery and rocket positions with the help of weapon locating radars and effectively neutralise them with own firepower resources. The trend is towards precision so as to reduce logistic cost of each successful engagement. Dependance on artillery to achieve favourable outcomes will increase. SP’s: Military analysts often talk about the characteristic of fire power to shape a battlefield. Can you elaborate on this issue for the understanding of the layman? DGArty: Shaping the battlefield is a concept involved in the practice of manoeuvre warfare that refers to shaping a desired situation on the battlefield and gaining military advantage for own forces. Successful shaping of the battlefield facilitates channelising the enemy to conform to own strategy and will. In this, Artillery plays a major role, which includes discerning the enemies’ intentions by employing surveillance resources; engaging them with firepower simultaneously in forward and depth areas as well as on the flanks, and employing appropriate fire power assets with the intention of making them lose their initiative, coherence and force them to fight a disorganised battle while ensuring the integrity of own forces and plans. SP’s: What are the future trends in the development of gun systems as there is a view that it has reached its plateau of development in terms of reach, destructive power and accuracy? DGArty: While delivery means may have reached a plateau in reach of gun systems, a lot of work is on for improving the efficacy of ammunition. This includes improved accuracies and destructive power. Micro electronics are being increasingly used for development of smart, precision, near precision and area denial ammunition systems. At present the technology is extremely expensive and needs to be refined to make it qualify in a cost benefit analysis. SP’s: What are your plans to develop/acquire precision guided ammunitions? What are the ranges and the type of accuracy that you are looking for? DGArty: We would be interested in affordable solutions for smart ammunition, precision ammunition or ammunition with improved accuracy at ranges of up to 45 km for guns. Typically a precision system has to give pin point accuracy while a near precision ammunition should provide accuracies of up to 30-50 m. In addition, solutions for extension of range of 155mm ammunition beyond 45 km with precision capability are also of interest to us. Army has commenced involvement of academia and industry in addition to DRDO/OFB through initiatives of Army Design Bureau and Army Tech Board for the purpose. SP’s: After about 25 years of neglect, it is now understood that attempts are afoot by the Army to fulfill its long-postponed 1999 Field Artillery Rationalisation Plan (FARP), under which the army aims to import, locally develop, and licence-produce some 2,820-3,000 assorted 155mm howitzers to equip its artillery regiments. Would you like to amplify on the progress so far? DGArty: Artillery Rationalization Plan was first perceived in year 2000, wherein 155mm was made the standard gun system for Indian Artillery. Accordingly, ‘Artillery Profile’ was conceived and promulgated with emphasis on Mediumisation of Artillery. Since then, based on our operational necessity, concerted effort has resulted in successfully contracting of 155mm/39 Cal Ultra-Light Howitzers from US Government and 155mm/52 Cal Tracked (Self Propelled) Artillery guns with L & T. To give impetus to indigenisation major projects such as 155 mm/45 Cal Dhanush Gun System, design and development by OFB and 155 mm/52 Calibre Advance Towed Artillery Gun System (ATA GS) designed by DRDO in partnership with private industry is also being pursued. SP’s: It was reported that in May 2015 the Ministry of Defence (MoD) approved the import of 145 M777s, 155mm ultra light howitzer, along with Selex Laser Inertial Artillery Pointing Systems through the US foreign military sales programme. Can you elaborate on its progress? DGArty: The contract for procurement of 145 Nos of 155mm/9 calibre Ultra Light Howitzer (ULH) was signed with US Government in Nov 2016. These howitzers are being procured under US Foreign Military Sales Programme. As per the contract, US Government will deliver 25 fully formed howitzers from USA/UK and balance 120 howitzers will be assembled in India. The delivery of these howitzers will be completed over a period of four years. SP’s: What is the progress on Dhanush Towed Howitzer 155mm, 45 calibre, being manufactured by the OFB? DGArty: 155mm/45 Calibre Dhanush Towed Howitzer being manufactured by OFB has completed the Field Evaluation Trials (FET) less DGQA trials of Automatic Gun Sighting System and Digital Intercommunication System. The guns are currently undergoing the user exploitation to test the robustness and efficacy of the system. Recently, within a span of three months, in summer of 2017, two incidents were noticed during the user exploitation phase at Pokhran and investigation has been ordered to establish the cause. Once the investigation is completed, remedial action will be taken and user exploitation will be resumed. Post successful GS Evaluation and user exploitation, the Bulk Production Clearance (BPC) will be granted to OFB. SP’s: Are there any new developments in mortar systems that artillery should looking at? DGArty: Presently Regiment of Artillery is holding 120mm Mortar Regiments which are mainly orbatted to field formations in mountains/high altitude area (HAA). However, as per operational and tactical requirement for high angle firing with higher rate of fire in mountains/HAA, the importance of mortars is likely to continue in the future. The existing 120mm mortar is reliable, robust and meeting our operational and tactical requirements. The development of guided bombs for increasing the accuracy and range are under consideration depending on cost benefit analysis. SP’s: The battlefield is getting deeper with long range artillery weapons resulting in the requirement of better target acquisition and battle damage assessment systems. What are the plans for the modernisation of Surveillance and Target Acquisition branch of the Indian Artillery? DGArty: The surveillance and target acquisition aspects contribute to real time situational awareness and targeting. This is a key result area for us. We are in the process of developing multi-dimensional, multi-spectral and all weather capability for the same to be able to cover the length and breadth of the battle space. For this we are developing satellite, airborne as well as ground based capability. Sensors ranging from airborne synthetic aperture radars, and optical devices to ground based battlefield surveillance radars, weapon locating radars and electro-optical sensor are available. We are in touch with domestic and international advances in these technologies and constantly seek to upgrade and develop indigenous solutions in consonance with operational environment. SP’s: A part of the Battle Management System (BMS), is every artillery weapon platform to be a ‘situational awareness platform’ or is this going to be done on a selective basis? DGArty: Artillery is a part of the BMS. However, this is still at evolving stage. 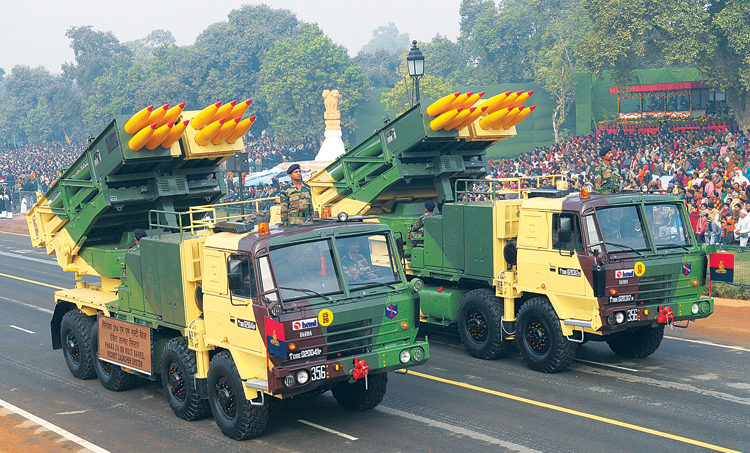 Unlike other arms of Army, Artillery Command and Control Centres will be made BMS compatible, rather than platforms. SP’s: Sensors play an important role in the present battle field for providing persistent situational awareness by day, night and adverse weather conditions. What are your plans for acquiring such advance systems? DGArty: Our RPVs are capable of spot surveillance on any emerging target. We are looking at wide area electro-optical payloads and exploiting the synthetic aperture radar, payloads along with on demand satellite/imagery to enable acquisition of persistent surveillance capability over any given area of responsibility. BMS once inducted will give adequate impetus to enhancing battlefield transparency. Of special interest are the foliage penetration radars to enhance our surveillance capability in forested areas to give our forces the requisite edge by achieving complete battlefield transparency. Artillery plays a major role, which includes discerning the enemies’ intentions by employing surveillance resources; engaging them with firepower simultaneously in forward and depth areas as well as on the flanks, and employing appropriate fire power assets with the intention of making them lose their initiative, coherence and force them to fight a disorganised battle while ensuring the integrity of own forces and plans. SP’s: What is the progress on BMS and has the digitised network reached a level for providing seamless fire power? DGArty: The BMS is at prototype development stage by the developing agencies. SP’s: UAVs, UCAVs and aerostats are recognised as force-multipliers in the modern battlefield and have become important part of weapon inventory of many advanced armies of the world. Will the artillery be the custodian of such force-multipliers or will they be inducted in all combat arms. What are your plans regarding their induction and employment? DGArty: There is no doubt that unmanned systems are the future in all three dimensions of warfare. RPAs have various classifications including micro/mini, short-range and HALE/MALE. The Artillery will be custodians of the short-range and HALE/MALE class of RPAs while the micro/mini RPAs will be authorised to other arms and services based on requirement. As far as the short-range and HALE/MALE class of RPAs is concerned, we intend to equip all our fighting formations with this critical technology so as to enhance our intelligence, surveillance and the targeting capability. SP’s: What is likely to be ratio of guns, rockets and missiles in the artillery? DGArty: Guns will continue as the mainstay of the Artillery, while rockets and missiles will be held selectively to cater for operational depths. SP’s: What are the plans for ‘Make in India’ and indigenisation, are there any gun development programmes being carried under this? DGArty: The Artillery is looking at ‘Make in India’ and indigenisation in a very big way. All our procurements are based on indigenisation as the ultimate aim. The Dhanush, Advanced Towed Artillery Gun System (ATA GS) and upgunned 130mm are indigenous gun development and production programmes that we are whole heartedly supporting. The other gun systems such as the tracked SP guns, mounted gun system and towed gun systems will also have fair degree of indigenous content. Every weapon platform has a large number of support systems. This is one area where we are giving impetus to indigenisation so as to negate the heavy import costs. Ammunition for existing and futuristic gun systems is completely made in India. In addition, the Pinaka rocket system and its ammunition is completely indigenous while efforts are being made for indigenous production of other types of rockets, as well.